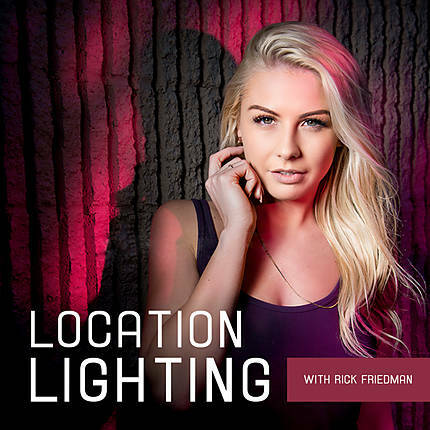 If you have ever wanted to perfect your use of speedlights, you won't want to miss this workshop with award-winning photographer Rick Friedman! Whether you are a professional or amateur, you will greatly improve your knowledge of lighting when you learn how to properly utilize speedlights. We'll begin by creating interesting light with one speedlight and then progress to using multiple speedlights. You'll work with models and use different light modifiers, grip equipment, and radio triggers to obtain the desired lighting effects. If weather permits, we'll also move outside to get different shots along the building. You can plan on leaving feeling empowered to capture great images, no matter what lighting situation you come up against! *Bring a camera, lenses, on-camera flashes, and lunch/snack. *Rick will instruct using both Nikon and Canon systems. *Attendees must already possess an understanding of ISO, shutter speed, aperture (FStop), and the function buttons of their speedlights. SAVE $49 when you register for both "Location Lighting" (UUU358) and "Advanced Location Lighting" (UUU369)! Add both classes to your cart and the savings will be automatic. There are currently no upcoming classes. Unique University® is the highly acclaimed education component of Unique Photo®, NJ’s only camera and video superstore. There is over 2000 sq. ft. of learning space, including our start-of-the art, 1000 sq. ft. main presentation hall. Unique University’s mission is to help our visitors “Create Better Pictures” by providing photography education for beginners to pros. With events daily, it is the place where photography groups such as local camera clubs, ASMP, PPA and others meet. We have a full curriculum of classes and seminars from world famous speakers such as Art Wolfe, Rick Sammon, Michael Yamashita, Tyler Stableford, Lindsay Adler, and Will Crockett. We offer photography experiences to such places as the Prudential Center for Seton Hall Men's Basketball, Meadowlands Horse Racetrack, Lakota Wolf Preserve, NJ Jackals Baseball, Rutgers Football, Botanical Gardens, Festival of Ballooning, and much more. Our technical classes include such topics as basic D-SLR photography, lighting techniques, Adobe Photoshop, Elements, and Lightroom, macro photography, composition, editing and printing, wedding photography, HDR photography, working with speedlights, how to use social media, digital organization, one-on-one instruction, and much more. Unless stated otherwise, classes are held in the Unique University classroom within the Unique Photo SuperStore (123 US Highway 46 West, Fairfield, NJ 07004). You're encouraged to bring your camera and a notebook and pen to most classes. Some classes will require additional equipment, so please check the class descriptions. Will lunch or refreshments be included? Lunch and refreshments are not provided for any classes under 6 hours unless noted. You can register online, in-store at the concierge, or by phone at either 973-377-6454 or 973-377-2007. Please note that you will need to provide payment information. For most classes, you're free to register at the concierge desk prior to the start of the class. Please note that there are some classes that offer "Early Bird Special" rates and others that have limited seating, so it would be in your best interest to register prior to the dates of such classes. I wanted to register for ______ class, but it is now sold out. Is there a waiting list? Please contact us at 973-377-6454 or university@uniquephoto.com with the following information: your name, phone number, email address, and the class name and date. My question has not been addressed here. Is there someone I can contact? Please contact us at 973-377-6454 or university@uniquephoto.com with any additional inquiries. - Classes costing less than $99 may be canceled up to 48 hours in advance for a full refund. For classes costing $100 or more, advanced notice of seven days before the class is necessary for a full refund. - Requests for cancellation made after these deadlines will be awarded store credit in the amount paid for registration towards a future Unique University seminar or workshop. - Cancellations made within 24 hours of the beginning of a class will not be honored and no refund or credit will be given. - Cancellations of any class utilizing models will be subject to a cancellation fee of 50% of the purchased price (up to $100). ** Attention American Express cardholders: If you cancel a registration for a class costing $100 or more, there will be a 3% cancellation fee deducted from your refund or store credit. I attended this workshop last year. Rick and his assistants do an awesome job! Not only did I learn a lot from this workshop... but Rick always made the most of every situation and I felt like I could ask any question at any time (in regards to the workshop). If you haven't been there... then I highly recommend it. Have taken 2 of Rick's workshops/seminars in the past and may well attend in the future. No question too big or too small for Rick. Always provides helpful guidance whether complex or simple without making you feel like you shouldn't have asked. Informative and fun!!! I took Rick's workshop in 2011. His workshop is really hands on and lots of fun! I learned so much about lighting and great tips!